Did you know putting a plant on your desk will boost your productivity? Or that taking smaller sips of coffee over a longer period of time will make you happier than just downing a shot of espresso? These are Happiness Hacks! They’re easy and they work. Here are hundreds of shortcuts to brighten your day and boost your mood - and the science to prove why they work. 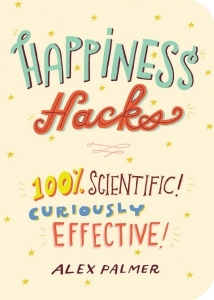 From happiness at work and happiness in love, to happiness in history or simply finding that so-called “happy place,” Happiness Hacks is the ultimate life hack to improve your life, one curiously effective step at a time. Did you know. Happy people have lower heart rates, Putting yellow objects around the house will cheer you up, The less you worry about happiness, the more likely you are to find it! A cleverly curated collection of scientifically proven tips and tricks to fast-track your way to happiness - right here, right now!